At Tech World last month, our team showed off some of the latest Tango-enabled games. One crowd favorite was Domino World by Schell Games which will will be available on the first Tango-enabled device, Lenovo’s Phab 2 Pro, coming this fall. Schell Games has adapted a few classic games, including Jenga, into smartphone augmented reality, and their developers share their experience and considerations they kept in mind as they gave dominoes a new twist. Google: How did your team first hear about Tango technology? 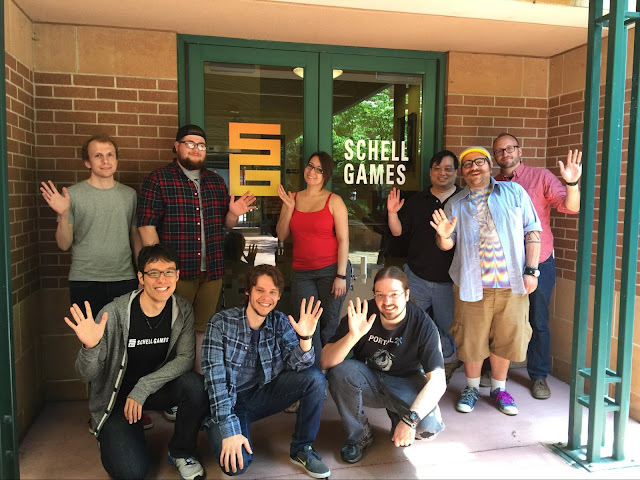 Schell Games: The Tango team invited us to their Game Developer Workshop where we learned about Tango and the types of apps we could develop for this platform. Google: You took a classic game, and added AR elements. How did you come to dominoes? Schell Games: At the Game Developer Workshop, we prototyped three games: a racing game, Jenga and a pet game. Of the three games, people connected the most with Jenga. People loved sharing a device to play the game together—and they loved that they didn’t have to pick up all the Jenga pieces when the game was over! And from a developer perspective, Jenga was great as it highlighted Tango’s ability to recognize surfaces. Based on how much people liked Jenga, we decided that Domino World would be our second game. Domino World gives players all the fun of dominoes, but without the setup effort or mess. We were inspired by YouTube videos where people of all ages were doing really creative things with dominoes. Our goal was to bring that experience to the phone as an immersive and fun augmented-reality experience. Google: Which Tango features did you use in Jenga and Domino World? Schell Games: We used motion tracking, which lets people walk around their dominoes or Jenga tower. We also used surface detection with the depth camera, so that the device recognizes when objects are placed on a surface. Google: How does your development approach differ for AR apps versus standard mobile apps? Schell Games: With Domino World, for example, our approach to augmented reality thrives on reinforcing the feeling that the player’s display is a “window on the world.” Toys and dominoes are (virtually) placed on the actual surfaces around the player, and the game’s controls aid players in manipulating objects in the space in front of them. As a result, the player is naturally encouraged move around as they view, adjust and otherwise shape their ever-growing creations. In contrast, traditional touchscreen controls largely work with metaphors of interacting with the screen’s image itself -- drawing on it, pinch-zooming it, etc. As a result, a more traditional touchscreen-controlled Domino World could have influenced players to remain more static and work with the existing view, as opposed to moving around to different vantage points. Google: We noticed that you use a landscape orientation for Domino World. How did you decide to take that approach. Many new players have a tendency to initially build wider versus deeper (possibly due to an instinctive desire to be able to more easily access their domino runs). UI controls at the edges of a landscape layout minimizes HUD overlap when working with wider versus. deeper runs. A landscape orientation naturally places players’ a hands at the device’s corners, which makes for a more stable grip during gameplay. Google: What surprised you the most while building with Tango? Schell Games: We were quite surprised at how easy it was to build with the Tango SDK and add Tango functionality to our apps. We used the Unity Engine which made the whole process quite seamless. It took us just over two weeks to build Jenga and 10 weeks to build Domino World from beginning to end. Google: How do you think Tango will change the way people play games? Schell Games: Tango makes it easy to play AR games. You don’t need to print and cut out AR trackers or markers to place throughout your room to help orient the phone. Instead, your phone always knows where it is in relation to the AR objects and you can easily start playing—whether you’re in a living room or on a bus. It’s incredible to have this experience with just your mobile device.